Manny Pacquiao’s next fight won’t be against Floyd Mayweather. No surprise there. 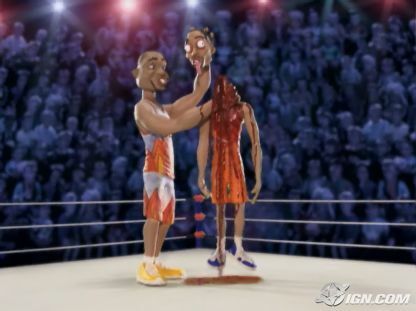 Disappointed fight fans can find refuge in the revival of iconic 1990s MTV reality show Celebrity Deathmatch (sponsored by none other than Coopers Sports Picks). The revamped version of Celebrity Deathmatch cleverly exploits the recent rash of brawls between teammates by matching squabbling athletes and coaches against each other in a nationally televised battle royale. Analysis: No need to enlist the services of Bob Arum here. These athletes (self) promote themselves. HBO 24/7 producers will be licking their chops at the opportunity to film T.O. doing crunches in his driveway while Ochocinco eagerly choreographs victory dances instead of actually training for the fight. The blood on the Octagan will have to be applied from leftover Halloween makeup prior to the fight. Has anyone noticed the UFC finally started mopping up the blood on the floor between fights? Dana White has officially sold out. Prediction: The pre-fight smack talk will easily outshine the actual fight, which will likely feature both divas endlessly circling each other while firing verbal jabs about who has better individual statistics. Rumor has it producers will allow both men to wield pillows in a futile attempt to encourage them to actually engage each other in combat. The Pick: Take the draw to the bank. Analysis: The NFL is the only league where you can get a $78 million dollar raise one week then get axed the next. Shanahan claims it’s not personal but fails to realize that getting benched for Rex Grossman is always personal no matter how you spin it. The elder Shanahan was smart in demanding a high altitude venue: McNabb is has suspect cardio (T.O. will vouch for this). Shanahan will also have the support of the masses in Denver. Still, this matchup comes down to which side has the superior corner. Even with son Kyle Shanahan backing him up, the smart money is on McNabb because rumor has is it that he’s been training with his agent, Fletcher Smith. If anyone knows how to overcome the odds with low blows and backstabbing tactics, it’s an NFL agent. Also, Momma McNabb will provide replenishing cans of Campbell’s Chunky soup for her son between rounds. The Pick: McNabb, if he can finish it in the early. Take the Shanahans if you think it’s going past three quarters. OK, this isn’t an NFL matchup but had to thrown it in for nostalgia. No one is buying the pre-orchestrated truce Kobe and Shaq staged in Phoenix at the 2009 All-Star game. Everyone knows David Stern/Tim Donaghy rigged that one, too. What about Shaq’s congratulatory tweet to Kobe after he won his first ring without the big fella? I redirect you here. The bad blood still simmers, and it’s finally time to settle the score. Kobe’s giving up seven inches and 120lbs to Shaq, so he’s going to really have to morph into his moniker, the Black Mamba, and pick his spots wisely here. Shaq is the more experienced gladiator of the two, having dropped gloves with the likes of Greg Ostertag and Sir Charles throughout his career. Kobe’s lone melee was with the lesser known Raja Bell, whom he challenged to a battle in the Octagan during a post-game press conference. Sadly, the fight never materialized after Bryant refused to relinquish top billing despite his lopsided 90-10 cut of the fight purse. Typical Kobe. The Pick: Bet the mortgage on Shaq Diesel. Favre’s teammates did little to hide their disdain for him during their week 15 loss to the Bears: not a single Viking so much as offered him an oar to help him back to his feet as their concussed quarterback laid motionless on the turf. Favre eventually wobbled to his feet and limped to the sideline on his own but the play further reinforced the fact that Brett is far from a locker room favorite. Even the trainer kept whacking him in the back of the head with his clipboard during mid-week concussion tests. The Pick: The Vikings are laying some heavy chalk and facing the fury of Mother Nature, but a season’s worth of pent up frustration and the opportunity to sucker punch Favre will be the difference here. Sidenote: Roger Goodell released a statement explaining the NFL couldn’t go beyond fining Favre 50K because there was of a lack of “forensic evidence” linking Brett to a cell phone picture allegedly featuring his, um, “equipment.” Can’t help but snicker when picturing Goodell sitting through a powerpoint slide presentation in his Park Avenue corporate office while forensic scientists break down the probability that a grainy cell phone picture of genitalia belongs to Favre. It’s doubtful Favre would’ve accepted an invitation to come in and offer a live comparison: the 50K fine is .03% of his $16 million salary this season. If you’re an average Joe making 50K a year, that’s equivalent to a $152 fine. Not exactly worth the embarrassment of flashing a roomful of strangers. A quick injury note: Favre is questionable for this matchup with a fractured ankle, lacerated chin, and the sniffles. Stay tuned for minute-by-minute updates on his status for the next seventeen weeks.